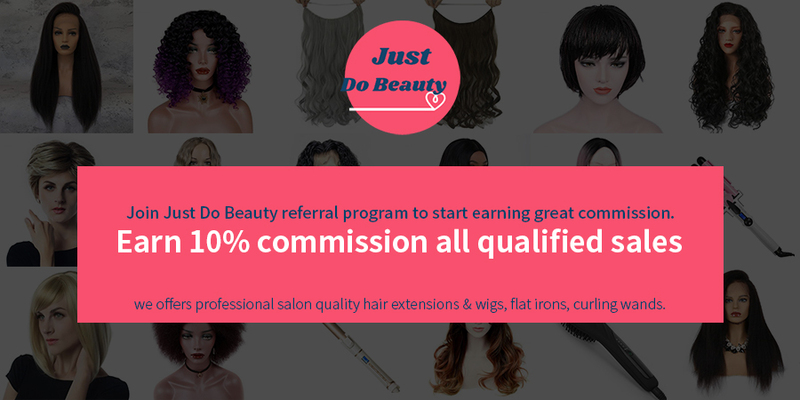 Join Just Do Beauty referral program to start earning great commission on our wide variety of 100% high quality human virgin hair products such as human hair lace wigs, lace front wigs, synthetic wigs, human hair extensions and Styling tools. To start earning commission, all you have to do is apply to join our affiliate program. We do all the hard work for you, so there’s no need to handle any processing, billing and shipping of any products, it’s that simple. Join our great partnership to start earning commission today. How it work Join our affiliate program for free and earn 10% commission all qualified sales. It costs you nothing to participate; it’s free, instead, we pay you commissions on all qualifying sales that is made on justdobeauty.com through your affiliate link from your web site, blog site, sale leads and social media etc. We handle all the details from ordering to shipping to customer service. It’s that simple Visit our online store at justdobeauty.com to learn more about our affiliate program today! Commission: Earn 10% commission all qualified sales. Note: shipping and taxes are excluded from the order's total by default. • Visitor clicks on your affiliate referral link on the website you share it on. • A cookie is placed in their browser for tracking purposes. • Cookie is valid for 30 days. • No need for order to be place in 24 hours’ browsing time - our cookies are stored for 30 days. • Once the order has been placed, we will review and approve the sale. You will receive a commission for sending an authorised sales, leads, and/or clicks via Your Links. On all qualified sales. Payments are made on the each month. If you have any question about our affiliate program please email us at service@justdobeauty.com. We look forward to your partnership!